I made cupcakes as my contribution to the refreshment table at the recital last night. I used Pioneer woman’s recipe and I have to say I was disappointed. The cake was rather dry, a total downer. Now, the problem might have been that I baked them late Thursday night and went to bed with the cupcakes warm on the counter. If I’d waited for them to cool and then popped them into a tupperware to wait until frosting time I mightn’t have had the problem. Anyway, I made those an that got me thinking about cup cakes in general and I made another batch to share with friends today. I have this book, In it is a recipe called “The Hostess With the Mostess Cupcakes” I bet you can guess what those are like. I set out to make them and that is where the near geniusness came in. 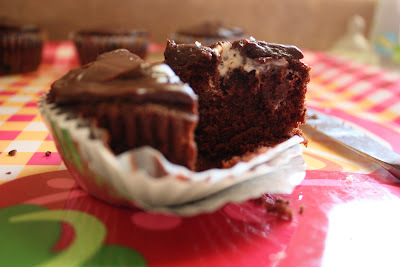 The book says to fill the chocolate cup cakes with plain old white icing. I was not on board with that. Cupcake filling should be creamy and delicious in a way simple butter, milk and powdered sugar icing can never be. It happened that I had half a can of sweetened condensed milk in my fridge, also some heavy cream. That got me thinking, “Why have I never mixed those two divine ingredients?” So, that is what I did. I whipped a cup or so of cream until it was good and fluffy, then I folded in about a half cup of sweetened condensed milk and gave it all a good beating. So I filled a piping bag and squirted generous amounts of the stuff into each and every cupcake. Even the already frosted yellow recital leftovers got a shot of the creamed heaven. I frosted over everything with chocolate ganache and that was that. Observe this bisected cupcake specimen. Where is the cream filling? What happened to all of that luscious goo? I re-filled my piping bag three times to get through all of those cakes. What on earth happened to it all? Was it absorbed into the cake? Did it ooze back out through the top? I don’t know. I do know these were a sorry excuse for filled cupcakes, and as genius as my whipped sweet and condensed cream may have been, the over all project was a flop. I’ll have to come up with some other way to use the heavenly cream of my genius. As good as it is on it’s own, it can’t be considered truly genius until a proper application is found. I’d still take one of your failed specimens. It looks delicious. 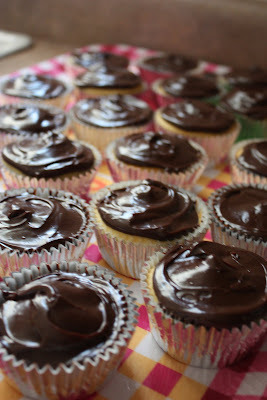 I love doing filled cupcakes, and once did a whipped cream-based filling that similarly disappeared. My favorite filling now is sour cream and vanilla pudding powder mixed together, with a little sweetness added. Sounds funny, but it has a very nice slight tartness that contrasts well with buttercream on the top for icing. Oh yum. I definitely want to be in on whatever it is you decide to fill with your wonder mixture, though. Have you thought about cream puffs?